I’m aware that this is probably “on the list” (like everything else?) but a stripped-down UI with no graphics and just text views of data tables would be wonderful. We’d also need expanded commands to place/cancel orders, build, assign experts, etc. 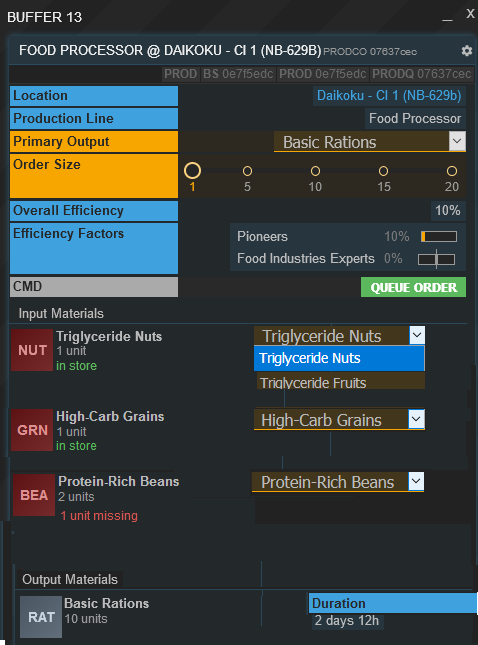 I’d also love the ability to write scripts to place orders as soon as production cycles complete, etc, so I have to actively manage my business less frequently. I guess there should be a limit on the number of commands I can send to the server every hour to stop exploits, or something. I don’t know if this is on the list, but I’d like the ability to have tabs within a frame. I’ve got a number of screens that are almost identical, except for one or two frames that change. A big fundamental flaw with the game right now is that forging ahead to higher tech levels doesn’t get you much apart from bragging rights (except maybe fuel, and some really high tech sales to MM). High-tech players should have something useful to offer lower tech players, i.e. something unique that T1 riff-raff can’t produce themselves (but can still consume). Edit: As the game moves on and new places become accessible, old bases (especially resource extraction) may become not profitable any more. I think that one should (a) get something back for demolishing buildings and (b) be able to “pack up” the CM and fly it to a different planet. Agreed about resource extraction, I’ve been concerned about how that’ll play out as we advance through the tiers - though I’m probably a little biased since it’s been my primary (until recently, only) market the whole time I’ve been playing. If we ever actually managed to settle that max Hydrogen planet in Hortus, my entire Hydrogen operation on 763c (and with it my company) would pretty much instantly collapse cos there’s no way I could compete with the prices or quantities a base there could sell it at - they could flood the market at prices only they could make money on. I already wince every time molp drops off Hydrogen at prices just barely above the break even point for my planet (I think 878b has just under double the H levels of 763c, but that’s still nothing compared with the higher tier planets), while similarly I can afford to sell at prices that people on Vallis can’t - any newbies that decide to go into H production on Vallis are sunk before they start just now. When that happens it’d be very difficult to recover from as you can’t easily re-tool to produce something else instead, especially now you’re not making any profits. It seems like COLIQ is baked into the future of anyone who - at the lower tiers - specialises in resource extraction. I suppose maybe the intent is you only do minimal resource extraction until t3-4 opens up and focus on other industries until then. Many games have their recipes for higher level stuff still include tier 1 resources. It isn’t a perfect solution, but it can work. And most of us assumed the luxury resources would boost us above 100% efficiency, not be needed to achieve 100% efficiency. If you tweak this, and have luxury truly be a luxury, then the T1 folks would actually benefit from something the higher tier folks were producing. Could the generic “commodity order filled”/“a trade has taken place” notification messages be replaced with information about the actual transaction? I had 13 notifications when I logged in, and the notification log was not helpful. The details are fine, but having to click through on every message just to see what happened is cumbersome. “Bought/sold X COMMODITY on MARKET for Y total CURRENCY” with “(Z left)” if an order was only partially filled. That’d let you see at a quick glance exactly what trades happened. The full trade details could still be available if one clicks through. In addition, it would be very useful to have a simple ledger of every transaction your company has ever completed, showing market, commodity, timestamp, quantity, trade partner, trading cost, and for commodities you sold, your average cost basis. Ideally, it’d be easy to sort/filter the ledger, and export its contents for post-processing via spreadsheets/etc. the universe: planets, resources, jumps from one place to another. basically the galaxy map. the neighbors: a chat channel about what’s needed where, or what’s overproduced, what planets are recruiting players, or warning them away. the company creation assistant previewed in dev log 168 looks great so far, keep adding more things! Glad you like the changes so far! I don’t know if you saw, molp also shared the first page of the new setup process in a dev log a few weeks ago. The ability to peek into the galaxy and some sort of up-to-date, curated and/or community-voted “most wanted” package or industry are both on our radar, although I’m not sure either will make it into the next test. I’ll put your other suggestions on The List™. Cheers! I would like to share some idea which I was thinking while we wait for big reset. 1st of all this is just concept which in basic don't sound like a part of this type of game, but please don't judge to quickly and try to contribute in this topic because this could affect lot of a game play. If in begging of game all universe is mostly unknown to us, and we only know which resources we have at our starting planets. So in this scenario there would be need for new type of players, something like “Explorers”. Explorers will have starting space ships which they can use to explore surrounding Planets and Asteroid belts. Explorers will take their ships and fly to them, use some sort of equipment on their ship to explore stellar bodies and collect information about resources. Planets bodies will have permanent resources as they already have, but asteroids will have limited amount of resources. In order to have continues need for explorers, asteroids will be randomly spawn in systems, so there will be always something to explore. Result of exploration can be stored in some type of DataCard which can be offered on market and who have money and wish to do some mining of different ores or even catching Ice asteroids to deliver it to planets without water resource, could be interesting to see how this temporally boost of water can affect price on markets. How many there should be Asteroids and Planets with resources on them is something which need to be balanced. In order to give Explorers more different type of jobs beside resources exploration, they can also encounter some rear things in Universe like Alien monoliths, derelicts, anomalyes or something like that. And researching them you can find some expansive things which could be sold on markets. Explorers should also have possibility to have bases on planets and produce resources. Only different is when they leave planets on their exploration ship, production efficiency in base will drop down to some percent in order to balance game for other players who don’t have exploration ships and chose different path of game. So next question what about asteroids, in this concept we also need to implement new type of ships in order to mine ore from Asteroids. So player who chose to work with ore extraction could buy DataCard from Explorers at the market. Take their mining ship, travel to Asteroid and do a resource extraction on them. So while you are out in space and do resource mining on asteroid. You will also have production efficiency drop in order to balance game. This is just a concept which can be interested to think about, especially because there is a lot of space for improvement and adding new stuff. Please think about this and use your creativity to contribute and improve this idea. What you describe here is pretty much exactly what I pitch to @martin on a regular basis! We will get there eventually! I like new idea for planed reset. Just would like to add some my ideas and proposals to think about. What if Tir2 commodities need will start to be active when you achieve more than for example 200 of Pioneers. Luxuries should not be limited to only some Tier2 commodities, I think all Tier2 commodities can be used to achieve 100% in this way you will give different production possibilities to companies which depends of materials on that planet/market. 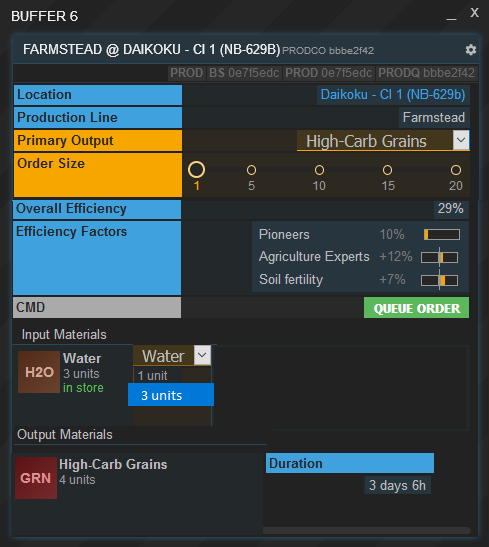 What if you can use Tie3 commodities to get efficiency boost, For example 10% of boost if you already fulfilled other needs. Private exchange should have some sort of Tax paying in order to make official purchase. What if there can be commodities which is forbidden on some planets, in that way there can be possible to look for black market exchange in order to get buy/sell of that commodities. In order to combine this with proposal 1. you can achieve more than 10% of boost if you get those products for your workers. In order to get use of Tax paying which would be collected by planet government. When enough taxes has been collected players can vote in order to chose how to use them on that planet. Like to start some global project on that planet for example Building space station or improving some of planet resources like searching for Ores, improving Planet quality to achieve better soil fertility, building observatory in order to see which ores can be find on planets in that system, etc. I have filling when I start to write this post, that there is no end of possibilities and ideas of what can be implemented. Lets end it here for now and give others time to think about this and maybe offer some their impression or ideas. Private exchange should have some sort of Tax paying in order to make official purchase. […] In order to get use of Tax paying which would be collected by planet government. When enough taxes has been collected players can vote in order to chose how to use them on that planet. To post a bulletin a fee will be necessary. The fees may go to a faction (if the market is located in a faction space) or to some other entity. Eventually we want corporations to control some aspects of planets and systems and therefore taxes could go to the dominating corporation. What makes a corporation dominating over others is up to debate though. Are there near-future plans to allow a corp to maintain a brief bio? When you view a corp with “corps” command, I feel that it would be useful for a corp to be able to provide some public information such as their purpose, services offered, contact procedures and methods etc. Yes, that and a public list of all corporations. 6 posts were split to a new topic: Inter-player contracts in next Alpha? 10 H20 turns into 7 Drinking Water at the food processor, which is then 0.7 tons (.1 ton per DW). 10 tons turned into 0.7 tons when the water was purified! Thus 93% of the water was pollutants that needed to be removed apparently. I think the recipe should be 10->10. People aren’t producing drinking water even though the price is stuck at the MM price of 63 because its not very profitable. Also, H20 should be .1 ton as well, if DW is .1 ton. This would make it shippable. At present it makes no sense to ship water because its too heavy, especially with the newly changed higher fuel costs. I moved your post into this thread, @Alexfrog! As for the balancing issues, I think @dbltnk should look into that.